rare JG 300 image currently on offer on ebay.de. However this image is a reproduction from the original negative in the collection of Jean-Yves Lorant; " ...il s'agit d'un de mes tirages de mon négatif de reproduction...tiré sur mon papier cartolyne baryté à tons chauds Agfa Rekord-Rapid dans les années 1980! " While the seller is unknown to us, this is a reproduction on barite photo paper produced during the 1980s pre-scanner era - and as Jean-Yves points out, of pretty decent quality considering that it has not been produced with a scanner. During the early 1980s the authors of the JG 300 history used their bathrooms as improvised photo labs. A number of such repros were sent out to JG 300 veterans (Stamp, Dieterle, Gross ) and fellow authors/researchers such as Jochen Prien or Bernd Barbas. Currently on offer at the following link. The original image is posted below - click to view in full screen mode! a) Aircraft type. Certainly not a G-10, but most probably a G-14/AS, as mentioned elsewhere re Gzik's Red 2 (another 2./JG 300 pilot). Elsewhere in our book Fw. 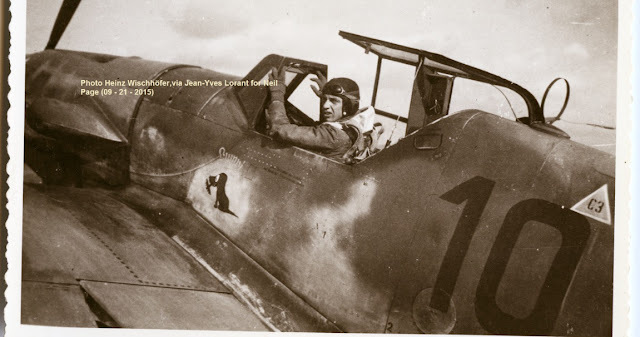 Hajo Riedel can be seen seated on the cowling of Red 10. Since Riedel was KIA on September 27th 1944, the series of photographs showing Red 10 could not have been taken after this date. And according to the Luftwaffe's monthly strength reports and the nominative loss reports, the first G-10s didn't reach I./JG 300 before November 1944.
b) Camouflage. Judging by the visible camouflage, this aircraft was most probably produced by MTT Regensburg. No great surprise here, since in September and October 1944, the bulk of known serial numbers worn by I./JG 300 aircraft was in the 780800-784000 range (MTT Regensburg). Knowing that it was most probably a MTT Regensburg aircraft, you can deduce the style of the unseen camouflage and national markings. In my opinion, Red 10 must have been painted in a very similar manner as Yellow 15 WNr. 783891 and Yellow 12 illustrated on pages 6, 17, 18, 19 and 185 of Eagle Editions' JG 300 volume 2. 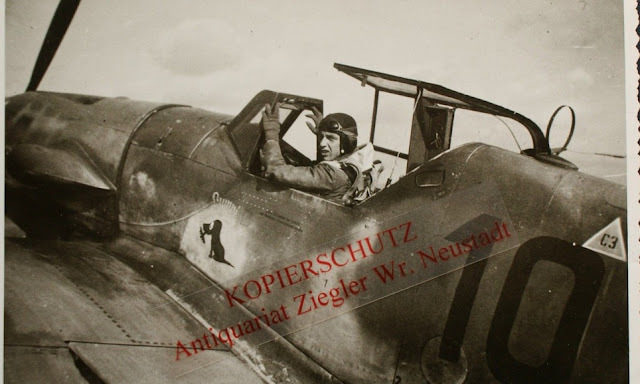 The only big difference with these latter aircraft is that on Hundsdörfer aircraft, there are signs of heavy overpainting under and ahead of the red number 10.
c) Markings. They are easily discernible on the three photographs from the spinner to the red 10. The only other possible marking on such an aircraft was the fuselage band, which, if applied, was necessarily red in September 1944...."